Have you ever read a book that when you finish you can still feel it swishing around in your brain? 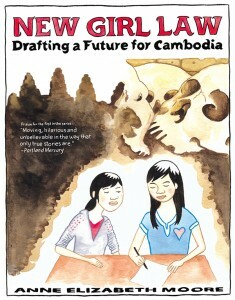 Yeah, New Girl Law: Drafting a Future for Cambodia by Anne Elizabeth Moore is that type of book. In the annals of Western feminists traveling to developing countries in an effort to empower, few tales are as truly feminist as Moore’s work in Cambodia. And while I say that as a friend of hers, I would say otherwise if I thought she was being imperialistic, as she is just as quick to critique friends’ work as a complete stranger. She would expect the same in return. This time, it is not the case. In New Girl Law, the follow-up to Cambodian Grrrl, Moore is working with her Cambodian roommates to rewrite, Chbap Srei, a book that has set up expectations for girls for generations. Considering that Moore was living with some of the first Cambodian young women to live in a college dormitory there were traditional expectations constantly being broken. “Empowering non-Western women” is an easy trap for Western feminists to fall into. Most of us have probably fallen into it at least once. Pre-2001 terrorist attacks, I sold 1-inch squares of burqua material for the Feminist Majority to bring awareness to what was happening to the women of Afghanistan. It gave me the ability to say, “I told you!” when the rest of the world discovered the Taliban. But it gave me little knowledge of how “we” could “save” the women repressed under their regime. So it would had been easy for Moore to land in Cambodia, whip out a copy of any pop culture feminist book and start teaching the young women she was living with about how feminism would save them. Rather, armed with feminist theory in her heart, Moore takes the time to investigate what it means to the women to be a woman in Cambodia. From hearing their complaints and where their draw their lines (Family approval is still an important factor in any marriage), Moore is far more a moderator than an empowering force. The young women and Moore debate not just modern day women’s roles, but also the exact words on how to state it. This is not an easy task as Cambodians as a whole, not just women, have not been raised to question society, much less gender roles. So much of their lives are unspoken. This is exhibited in two moving parts of the book where Moore gets the women to talk first about menstruation and then the genocide under Pol Pot. The first topic is one that is simply unacknowledged. Moore notes that despite living in a women's dormitory, one would never see a sanitary napkin or tampon anywhere. The latter is one that has been willfully untaught to young generations. For some of the women, Moore is the one to tell them that genocide happened in Cambodia. Yet there are parts of their lives where the Cambodian women are vocal in supporting. While they see the “progress” that comes from globalization, they see the downside to importing Western culture. At the same time, Moore struggles with the women’s acceptance of Nicholas Kristof-like solutions such as more garment factories. Moore’s irreverent writing style allows for you to be crying and laughing at the same time. And not that “I’m laughing so hard that I’m crying” either. So yes, have tissues at hand. It is a deceptively short book, but there will be times when you will want to put it down and walk away. You may even need a bit of chocolate before picking it back up. 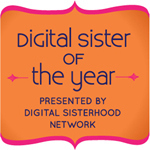 If you have ever thought, "How can I, as a privileged woman/man/feminist/person from the United States/Western world, help the women of [choose a developing country] achieve freedom and be empowered?" you need to read this book. Because the answer to that question may be to first sit back and listen to them. Please enjoy an excerpt from the book, chapter 3! Support Viva la Feminista by getting your copy through Powells or Indiebooks. Disclaimer: I received this book via a publicist.